Want to keep up with the latest on NetAssets.org? Sign up for Net Assets NOW, NBOA's free e-newsletter. Twice each month you'll get mobile-friendly articles, news updates, leadership insights and links to NBOA news and community discussions. Premium content is available only to NBOA members. Note: NBOA members automatically receive Net Assets NOW and do not need to subscribe. NBOA members can view past issues of the newsletter. If the form does not appear below, please fill it out here. 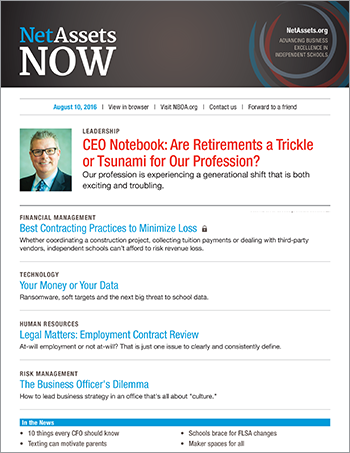 For access to premium content and to receive Net Assets magazine, you must be an NBOA member. Learn more about NBOA membership. "In an inbox filled to overflowing with emails [Net Assets NOW] stands out above all else as the one I not only always read but find beneficial every time. … Topics are always timely (are you guys reading my mind?) and so many, many times are relevant to the other leaders in my school. I look pretty good when I forward the links to admissions or marketing or division heads – they keep saying, 'Where do you find this great stuff?'"